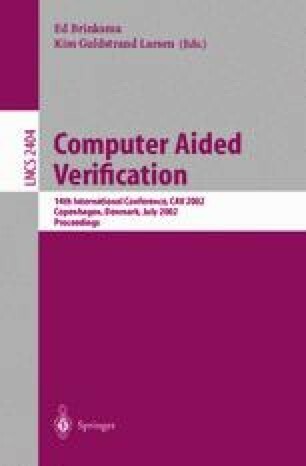 We describe new techniques for model checking in the counterexample guided abstraction/refinement framework. The abstraction phase ‘hides’ the logic of various variables, hence considering them as inputs. This type of abstraction may lead to ‘spurious’ counterexamples, i.e. traces that can not be simulated on the original (concrete) machine. We check whether a counterexample is real or spurious with a SAT checker. We then use a combination of Integer Linear Programming (ILP) and machine learning techniques for refining the abstraction based on the counterexample. The process is repeated until either a real counterexample is found or the property is verified. We have implemented these techniques on top of the model checker NuSMV and the SAT solver Chaff. Experimental results prove the viability of these new techniques. This research was sponsored by the Semiconductor Research Corporation (SRC) under contract no. 99-TJ-684, the National Science Foundation (NSF) under grant no. CCR-9803774, the Office of Naval Research (ONR), and the Naval Research Laboratory (NRL) under contract no. N00014-01-1-0796. The views and conclusions contained in this document are those of the author and should not be interpreted as representing the official policies, either expressed or implied, of SRC, NSF, ONR, NRL, the U.S. government or any other entity.